Paddy is featured on this Irish whiskey shot glass. 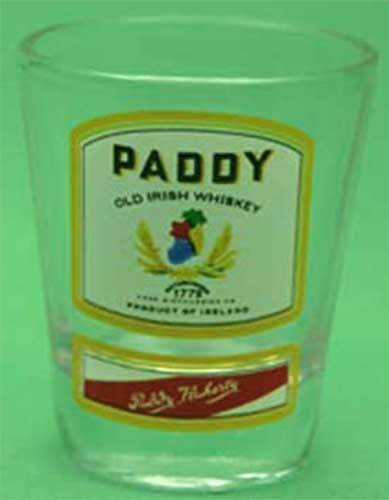 The Paddy Irish Whiskey shot glass is retired and is limited to stock on hand. The Paddy Irish Whiskey shot glass features the brand's logo that includes an image of Ireland. This Irish shot glass measures 2 1/4" tall and hold 2 ounces of whiskey. The Paddy whiskey shot glass, from The Irish Gift House, is made in Ireland by Liffey Artefacts and is gift boxed. Irish shot glass features the Claddagh along with shamrock accenting.